Welcome to the Paula Deen complaints department brought to you by HissingKitty. Experienced poor customer service? We make it easy to file a formal complaint against Paula Deen online. Simply use our free form and your feedback will be instantly forwarded for review. Need to contact the Paula Deen corporate office? We have the mailing address, phone number, and email address listed below. Yesterday I ordered the Take Out Easter dinner for 8. The order came in complete- missing over three main items. When bringing this up to the general manager of this establishment in Fairfield Texas location, I was insulted by the compensation offer Plus I didn't appreciate the sarcasm when I was told by the general manager that Paula Deen wouldn't want me to have a bad experience as he chuckled. Because of this issue occurring I did not enjoy the food and as they say this experience itself can ruin everything which is what happened in my case. Corporate office needs to know exactly what's going on and they're different establishments. I asked the general manager to email me our conversation and I noticed his emails were sent right back to his kitchen so corporate wouldn't find out? I left a message for the regional manager to contact me so that everyone can know the type of experience I had and now I will wait to see who contacts me. My husband and i visited your restaurant for our anniversary after spending the night in myrtle beach, we had been looking forward to the breakfast menu for WEEKS. My sister-in-law even kept my one year old(this was my first night away from my baby, ever!) my sister in laws son, my nephew who is 12, had a ball tournament in myrtle beach and it got canceled due to rain so she called and asked if we could pick him up for her, so we agreed. His ride was going to meet us here, they told us we could not be seated without him. I was told by the manager “we do not seat incomplete parties, so if you want breakfast, you need to be seated, and if your friend gets here later, then great, but he won’t be able to sit with you.” This is a TWELVE YEAR OLD BOY, not just a friend that can sit by himself. I explained the circumstances to the manager, and she had no empathy or compassion on the situation at all. Being that your restaurant refused to work with us, and our hearts were set on breakfast, we left and probably won’t be back. My family owns a restaurant so I completely understand the “rules are rules” deal, however, I also understand the situation where you work with the customer on things to make a customer happy to ensure a good experience and so the customer will come back. Needless to say, this didn’t happen with us. The breakfast sounded delicious and we were really looking forward to it, but we will probably never experience it with y’all with this kind of customer service. You might won’t to incorporate empathy and compassion into your company’s core values in order to maintain your level of customer satisfaction. They won’t answer the phone, even called all extensions, manager as well. Won’t be returning, until the professionalism improves. Are they open on Thanksgiving Day? Upon our first ever visit to a restaurant of yours we visited your location in SC. For 2 days we were extremely excited to eat there. Upon being seated we were told by our waitress that no food could be taken out. This “policy”, as we were informed it was, was no where to be found on the website prior to our visit. I completely understand if we were to place a 2nd request for food then turn around and ask for doggie bags or boxes, I get it that people do take advantage that way, however I am not one of them. I do not like the fact that I have to pay a flat fee then leave any “first helpings” behind that I simply cannot eat! That is not fair and should be illegal. If I’ve ordered and agreed to pay for food and simply cannot finish any of the first helpings I should reserve the right, as should everyone, to take home what we do not eat since we are most certainly paying for it. We were advised of the reason behind the policy and I completely agree while we were seated at your table, except that food not eaten yet paid for falls under my policy that if I choose to reheat what I’ve paid for that’s my American choice. I disagree strongly with your policy and find it offensive to those who choose to spend their hard earned vacation money at your establishments. Hi I want you to know how much I've enjoyed your cooking shows in years past. I think you are a genuinely nice person and great Southern cook. But my girlfriend and I went to your restaurant at the Bass Pro Shop in San Antonio,Texas and it was awful. The kinds of food you used to cook live on TV was not what we got at your restaurant. The biscuit and fried catfish were really good but the sides like creamed potatoes were cold, the squash casserole had tough squash and was tasteless. The collard greens were old and had no taste. The chicken patty with mushrooms was not seasoned unless you dipped every bite into the sauce. We were hoping it was going to be a place we would love to come back to. Also my peach cobbler was canned peaches with warm biscuit on top. Again tasteless. In South Texas we have wonderful fruits and veggies year round. Why don't your cooks use fresh? I'm sure you don't have anything to do with this, but perhaps you should, since it's YOUR PRODUCT. I've been patiently awaiting my new Paula Deen 8.5 Air Fryer. I ordered it 7 weeks ago, after I received an email saying it was back in stock and available. After ordering it (only the red, black and white were available, so I choose the red) AND the accessories, AND THEM TAKING MY MONEY almost immediately, I got an email saying it was a pre-order (?...why didn't they state that on the order page?) I was told my Air Fryer would be "in my home no later than May 11th". I waited a few weeks, and then started checking the status. Yep...still said it would arrive by May 11th. Waited...checked again Monday, May 7th. ...yep, still coming tomorrow.. Yahoo ! Finally !. Today, May 10th, I received an email saying my product was no longer available and they were cancelling my order !!! Funny thing...the place is offering it today !. And the accessories. Says it's available now. Says it can arrive as early as May 22nd. Have some one on your staff check out Evine. It's your product. You should know how upset many of us are. Where's my air fryer ???!!!?!!! Tonight my husband and I decided to experience Paula Deans new restaurant in Myrtle Beach, SC. We had the unexpected wait of only 15 minutes! What a pleasant surprise. We ordered your famous fried chicken, chicken pot pie, pot roast, creamy mashed potatoes, creamed corn, squash casserole and coleslaw. That was at 6:35 pm. We waited patiently and we were told by our waitress that it would be a little while longer for our food. At 7pm she told us it would be about 10 more minutes as they ran out of fried chicken. 15 minutes past and the waitress brought out our food, except for our chicken. My husband advised her to take back our food until the chicken was ready. At that point we asked for the manager, Steven. We explained how long we had been waiting for the fried chicken and his answer was, we make mistakes, let me find out how much longer. That was the last we saw of him until we left. When we left my husband told Steven that we would be contacting corporate. His response to us was "perfect".Also, we observed 3 other couples that got up and left the restaurant. Finally, at 7:40 our dinner arrived. Unfortunately, we will not be returning to the restaurant. Not a very good first impression! ! Would you agree? On Sunday 27th Aug appron 4pm I visited your small home store in Gatlinburg with my family. We are visiting from England and have stayed in Pigeon Forge for 14days. We were served by an elderly gentleman who was an absolute star and was asking us where we were from? And were we enjoying the smoky mountains. We were overjoyed with his service and I was telling him how proud and very patriotic everyone was. Sadly in England we aren't allowed to be and we engaged in a lovely conversation about this. Then to my absolute disgust this lady who was of large stature with long dark hair and glasses, wearing a blue dress came and rudely told the gentleman worker to stop talking about this subject as he needed to remember what shop he worked for. Both my young children were very upset to witness such disgusting rude behaviour, and we had to explain to them that some people were just like this in life. I have never felt so uncomfortable in my life as I did for that gentleman and can only presume what entailed after we left the store. I was that upset I nearly went back to confront this lady myself and tell her exactly how rude and disgusting she was and had been in front of me and my young children. This is my first impression of Paul Deen store and I will hope that this isn't what the company promotes in bad behaviour. That lady could have privately spoken when we left instead of berating that gentleman in our presence. Might I add it was I who started the conversation and at no point did this gentleman overstep the line or be inappropriate. I wish you to pass on our absolute delight to this gentleman and I would hope this lady is dealt with accordingly to her own disgusting behaviour. I made vegetable soup in my large spotted stew pot. Love the look. 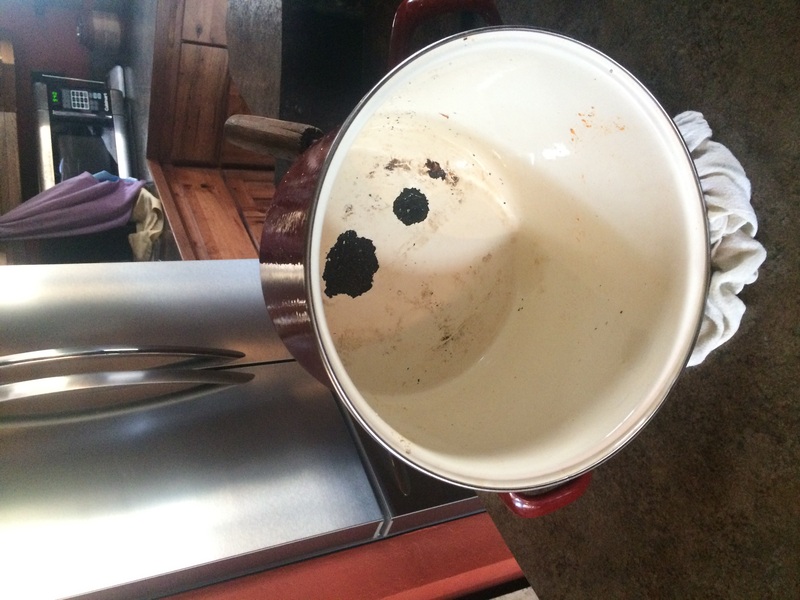 After cooking I went to wash it and found that in 3 spots in the bottom of the pan the enamel was off and black was showing. The enamel is gone.Will Paula Deen replace this or not? Tried to upload picture, cannot get camera to work either. 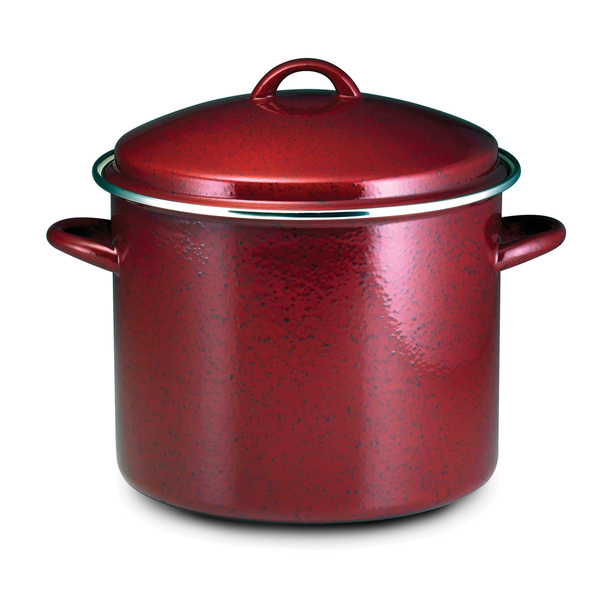 I recently received a large red soup pot, the red paint has tarnished. I'm not a happy camper. Love Paula Deen products, but this one takes the cake. Can you do something about this before I am forced to get corporate involved with my complaint. Should I mail it in? I don't understand why you don't let local artist have an area in your shops for good art. Love ya Miss Paula, but you are not an artist. Just sayin'. Thank you and have a good day. I purchase a Paula dean I call it a stock pan the big one I use to make soup and the enamel on the inside of the pan on the bottom. 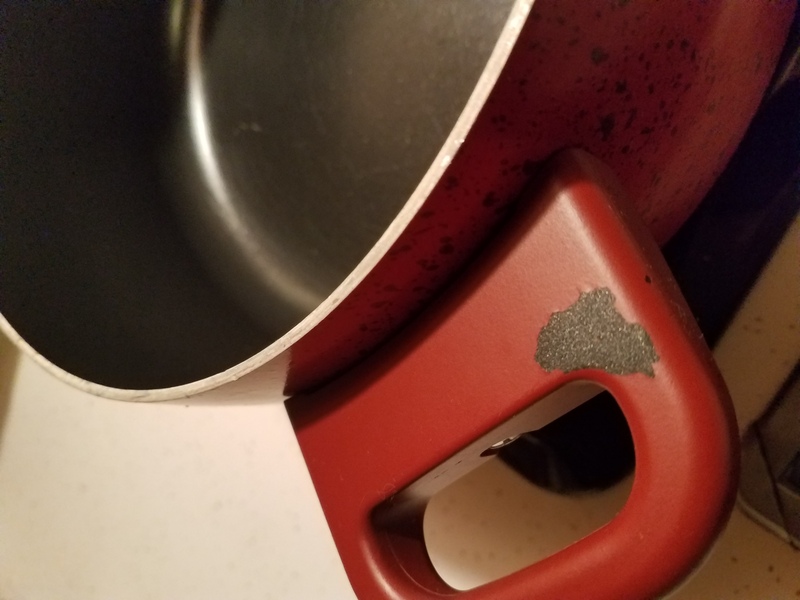 It has a very big spot that has come off can't use it anymore was so happy to get it but you had to watch the food would stick on bottom. I pay a lot of money and did not use it very often only use it when I made soup so dis pointed after buying it. I hope Paula reads this complaint! Oh!!! I am a great foodie and I get all my dishes and recipes at Paula Deen. The website has some exotic, easy, simple to do dishes which are tasty and gives a proper flavor to the food. Apart from this the cookware sets of Paula deen are simply fantastic. The aluminum construction with an easy-to-clean nonstick surface is of good quality. The lids are clear glass to monitor cooking at a glance. It gives a great look to the kitchen because of the design. When i had a get together at home, many people complimented me about the look of the sets I purchased from Paula Deen. They come in great colors that add some look to your kitchen. A thumps up from my side to Paula Deen on their design and style of cookware's. Have feedback for Paula Deen?